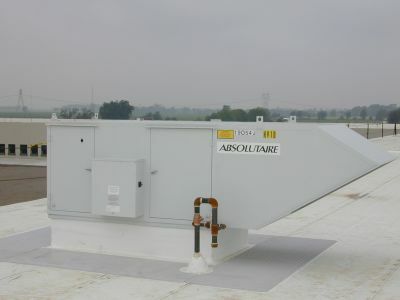 Target Corp., the second largest general merchandise retailer in the U.S., selected AbsolutAire 100% OA HTLV direct-fired systems to heat and ventilate a new distribution center in Columbus, Ohio. The 1,200,000-square-foot facility required 15 of the high-temperature, low-volume units. With an integrated control system, the AA-Series direct-fired systems were roof-mounted approximately 50-feet in from the perimeter to provide effective heating and ventilating to areas containing the highest occupant densities. The system airflow was designed to offset infiltration from more than 200 dock doors and skin loss from the tilt-up, insulated concrete structure. Heated ventilating air is discharged from the units, angled toward the floor and utilizing some natural induction, to ensure consistent temperatures throughout the facility. Other AbsolutAire system projects for Target Corp. include: DeKalb, IL; Little Rock, AR; Seattle, WA: and Tifton, GA.